Some pictures are worth a thousand words, but there are some that are worth even more. There have been many pictures in history that have told a story of either unbelievable triumph or unimaginable tragedy. When the RMS Titanic sank in 1912, it was considered, and still is, one of the worst things that has ever happened in the history of mankind. 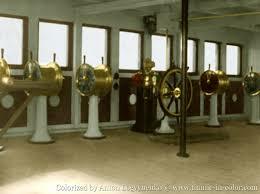 The ship was on her maiden voyage, and there were over 2200 people on board her. On the night of April 14th, 1912, the ship had hit an iceberg and had sunk in less than three hours. For months before the ship sailed from Southampton, England, there were very few pictures taken of her once she had been completed. 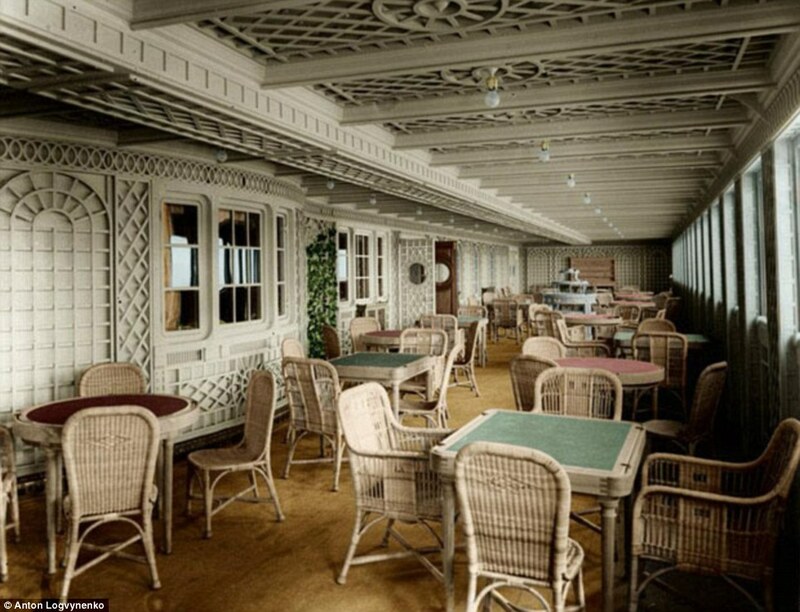 In the previous post, the colorized images were of the Titanic in color during her construction, but now here are the images of this beautiful ship that were taken of her interior, and then beatufiul color was added to them. 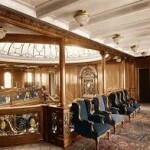 The RMS Titanic had many features that were worthy of the news. 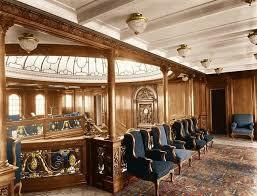 One of the crowning achievements that the builders of the ship were very proud of was the Grand Staircase. The Grand Staircase was made of the finest wood, and it was all made by hand. There was wrought iron that was woven into the design covered in gold leaf. The staircase also featured beautiful wood carvings and covered by a huge wrought iron and glass dome that let in the sun. Also, the Grand Staircase had a beautiful hand carved clock with two angels on it called Honor and Glory Crowning Time, which everyone marveled at whenever they saw it. 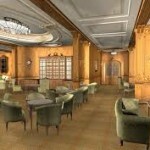 The Titanic had many places were the passengers could go and relax. This beautiful colorized picture is of the First Class Lounge, and in here, both men and woman could hang out, write letters, read books, and have a nice cup of tea while doing so. 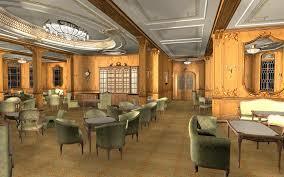 The lounge is famous not only for its luxurious furnishings, but it is also the place where First Class passenger Elizabeth Lines heard Bruce Ismay and Captain Smith talking about the Titanic’s speed and how more boilers were going to be lit. Later on, after the Titanic sank, Mrs. Lines was questioned at the Senate hearings about this incident, and she recalled it in detail exactly what she had heard. Another beatufiul place that the Titanic boasted was a special cafe that was supposed to give the illusion of fine outdoor dining at a sidewalk cafe in Paris, France. What made this Cafe Parisien so special was the fact it had large windows that showed spectacular views of the bright blue ocean. The windows also allowed natural light to come into the cafe, which was supposed to promote a healthy appetite. 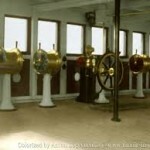 A lot of the passengers of the Titanic were given access to things that could not found on other ships at that time. 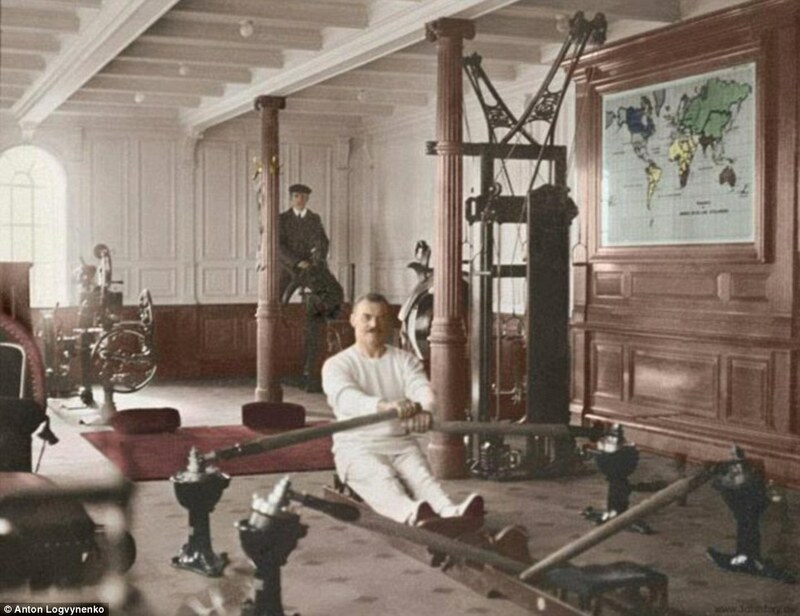 One of the most impressive amenities that the Titanic had was a gymnasium where passengers could exercise. The gymnasium boasted state-of-the-art equipment, and many people used it every single day religiously in order to stay in shape and get plenty of exercise. One such passenger that enjoyed all the gym equipment, was Colonel Archibald Gracie, who talked about it not only in the post-sinking interviews he gave before his death, but in the book that he published. 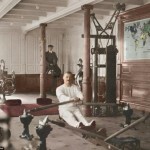 While this colorized photo does bring the gymnasium to life, it also shows just what was considered exercise equipment back at the beginning of the 20th century. The most famous place on the RMS Titanic was the bridge. It was here on the bridge that Murdoch gave the orders that doomed the ship, and this color image makes it seem like a quiet place when that is far from the truth. It was on the bridge that Captain Smith and J. Bruce Ismay were told by Thomas Andrews that the ship would sink in an hour or two. The bridge is a source of both intrigue and doom, but it was destroyed during the sinking, which makes images of it even more rare. 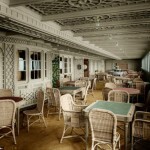 Colored images of the RMS Titanic are taking the world by storm. 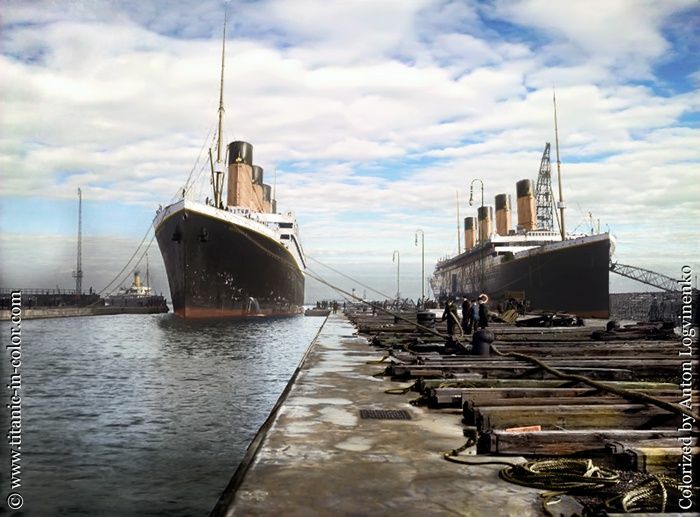 The whole world is amazed at what these very old pictures look like in color, and people who never thought the Titanic was interesting are finding new interest in the sunken ship. 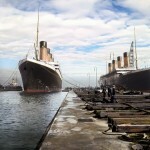 While the Titanic has been gone for almost 105 years, these images, both the colored and the black and white, will keep her in the thoughts and minds of everyone forever, and when the Titanic finally does dissolve, these images will be all that remains of the most famous ship that ever sailed the ocean blue.